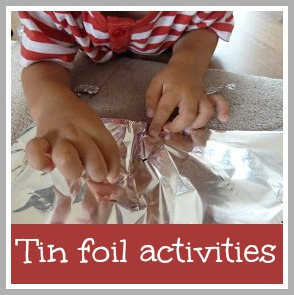 Here are some ideas for ways to entertain your toddler using tin foil! Rip it, tear it, scrunch it and create sculptures. Make cups and bowls for a tea party. Drop it flat from high up and watch it float down, then crumple a piece and drop it and see the difference. Wrap up and unwrap small toys. Screw pieces up into small balls and post into a bottle or box. Make a tin foil river in the garden - a really fun activity for a summer day! Lay a piece over textured objects on a hard surface and rub over with fingers, for example coins, leaves, brick, sand, small beads, spaghetti. Stick pieces onto paper and paint over them, or dip scrunched up pieces into the paint and use to stamp with. Pour some olive oil onto a sheet and paint and swirl with fingers. Lay a sheet out on a soft surface, poke holes with a cocktail stick and hold up to the light or a window to see the patterns. 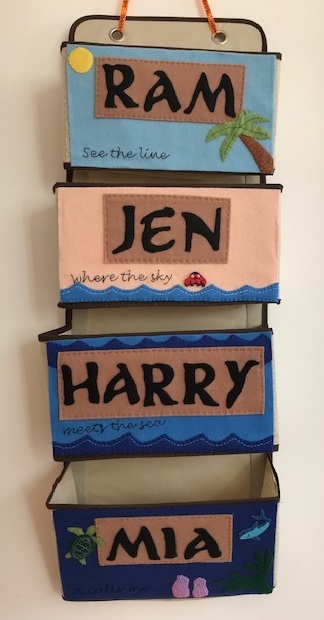 Lay a piece out on a soft but firm surface such as carpet and stamp patterns with household objects, for example duplo pieces, bottle and jar lids. Run over it with toy cars or tractors to create roads and train tracks. Make a mobile, make a windmill for the garden, cut out stars to go on the ceiling, make shapes to cook little cakes in, make a Blue Peter rocking horse! Thanks for the ideas! I love the one about making shapes to cook cakes in, may have to try that one out!